Socks from stash club: Oh yeah, I finished these. I finished these at the beginning of December. Just forgot to post about them here. We've been pretty stressed out at my house of late. Yarn: Opal Petticoat sock yarn, 2/24 acrylic for reinforcement thread. Color: #1292. Reinforcement thread is pastel mint green. Needles: Size 2 Addi Turbo Lace Circular. Comments: I can't seem to get enough of garter rib patterns. 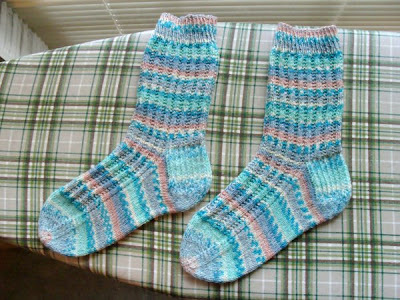 They look so good with the self striping yarns. I made these socks just a little wider and longer to accommodate my slightly larger left limb and they fit really good.